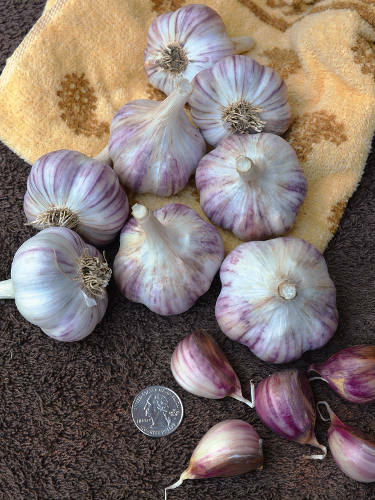 Highly recommended marbled purple stripe garlic, similar in size to porcelain garlics but with more cloves per bulb, Comes from the Siberian city of Khabarovsk. Mild and creamy when baked into mashed potatoes, bursting with flavor when raw; it’s worth having for mid-winter storage and hanging as decoration. Easy to grow. 4-6 cloves per bulb.